We’d love your help. Let us know what’s wrong with this preview of love, and you by Gretchen Gomez. To ask other readers questions about love, and you, please sign up. my baby. my all. i can't believe i wrote this. i can't believe my tears are all in these written pages. it's real! One of my fave people just released her debut poetry collection today and I couldn't be prouder. I spent a fair portion of this collection crying because I was able to relate so much. Everything hit me in the best way. Gretchen has such a beautiful way with words. This was just as brilliant as I was expecting. This beautiful soul of a poetess also known as my twin in the book blogging community, has released a book of poetry. I am now on my 3rd re-read & continue to find meaning and comfort within her words. For all those who have experienced that one toxic relationship, you know? the one you simply cannot let go...this one is for you. Love, and you will haunt you with each turn of a page & ultimately will leave you with hope for healing. waves This beautiful soul of a poetess also known as my twin in the book blogging community, has released a book of poetry. I am now on my 3rd re-read & continue to find meaning and comfort within her words. For all those who have experienced that one toxic relationship, you know? the one you simply cannot let go...this one is for you. Love, and you will haunt you with each turn of a page & ultimately will leave you with hope for healing. This is Gretchen’s debut novel and boy did she knock it right out of the park! I devoured this book in like 40 minutes and highlighted some of my favorite poems, which I will share with you in this review. When I finished the book I was left completely speechless because the book was just that beautiful. I actually teared up a little bit. To be completely honest, I won’t be doing much of a review just because I honestly feel like how do you put a ‘rating’ on something that is so raw and personal to the author. How do you ‘review’ someone’s life experiences when they are laid out in a format such as this. Personally, poetry speaks to me on a different level than prose. I’m not sure why. I just feel like poetry is meant to reach into the depths of a person and pull out their deepest emotions. It does this for both the author and the reader. I have picked a few passages from the book that did reach down inside me and I hope you enjoy them just as much as I did. These two passages are what completely won me over and made me realize that this book was going to speak to my experiences as well. This book should be read by every woman, whether she is in her teens, twenties or older. I think every generation of woman could learn something from the poetry in this book. When my daughter has her first heartbreak I will give her this book, when she has her second heartbreak I will give her the book again….are you sensing a pattern? I have been following Gretchen’s blog for a while now @Chicnerdreads and she would post poetry to her blog sometimes. Her poetry would always blow my mind, so much This book should be read by every woman, whether she is in her teens, twenties or older. I think every generation of woman could learn something from the poetry in this book. When my daughter has her first heartbreak I will give her this book, when she has her second heartbreak I will give her the book again….are you sensing a pattern? I have been following Gretchen’s blog for a while now @Chicnerdreads and she would post poetry to her blog sometimes. Her poetry would always blow my mind, so much so that I have commissioned a fellow artist to make a piece out of one of her poems. This little book was written by an amazing person that i meet through finding her Blog. I am not a poetry reader, I don't have anything at all against poetry but I just never pick it up for some stupid reason. 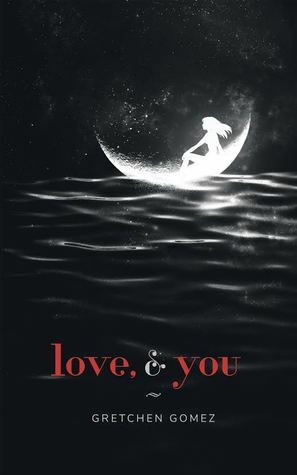 Love, and you is amazing, the whole second half of the book I had tears in my eyes and a fierceness in my heart. If you are a fan of poetry, feminism, and words that make you feel things I highly recommend this little book that packs such an emotional punch. Thank you for breaking my heart and for rebuilding it anew. Her words are so powerful and beautifully written. I was able to relate to almost every poem and they left me in tears. Every girl should pick up a copy and read this collection. I remember adding Love, & You to my wishlist as soon as I first heard about it and my interest increased steadily as I read glowing after glowing review. But I have to give credit when it's due and say it was actually Amanda's wonderful review that sealed the deal for me, confirming just how much I would be able to relate to the poems. And she was 100% right. It's been days since I devoured Love, & You in record time, and I still haven't recovered from the emotion overload. Because to say it crudely: damn, that girl can write powerful poetry! Wonderful, emotional, raw, beautiful, powerful, strong, exceptional... Trust me, I can keep the adjectives going for a long time if you let me. This poetry bundle is all about her experience with a toxic relationship and her slow recovery from it. The poems are highly personal and it really feels you get to know her a lot better through her poems. I truly admire her courage first talking about such a personal topic and then going ahead and publishing the poems afterwards! It's not widely known, but I was unfortunate enough to have a quite similar experience with a toxic relationship in the past. The details don't really matter right now, but it did mean that the poems in Love, & You made an even bigger impact on me than they would to others who haven't had such an experience. Trust me, she doesn't exaggerate the effects of such a relationship and its looong and difficult road to recovery. Writing (both poems and other forms) can be a very important form of self-therapy and I loved learning more about her journey through her writing. I wrote some poems myself after my experience that helped me learn about the past and accept what happened, but those just seemed like silly scribblings compared to those shared in Love, & You. I loved both the writing style, form and the way the different emotions are voiced. It's not often that I'm left speechless, but I found myself lost for words after finishing this bundle. Thank you for describing my own feelings and memories so much better than I could ever done! It's easy to say I can highly recommend Love, & You. I loved this collection of poems. I cried, I smiled, I felt every bit. Gretchen has a gift for making the reader relate & empathize. I am SO GLAD I bought this collection & I keep going back to read again & again. This was such beautiful, raw, poetry of the author's thoughts, feelings and experiences. I sat there reading this book from cover to cover without putting it down, tears streaming down my face, relating to certain things said and feeling for the poet. I borrowed this from Kindle Unlimited, not sure what to expect. Now I will be purchasing this for my library. It's just so beautiful, the kind of poetry you would want to read again and again. I will be checking out her blog and hope to see more po This was such beautiful, raw, poetry of the author's thoughts, feelings and experiences. I sat there reading this book from cover to cover without putting it down, tears streaming down my face, relating to certain things said and feeling for the poet. I borrowed this from Kindle Unlimited, not sure what to expect. Now I will be purchasing this for my library. It's just so beautiful, the kind of poetry you would want to read again and again. I will be checking out her blog and hope to see more poetry published by Gretchen Gomez in the future! "there were so many times i had him right next to me and it’s as if he wasn’t there at all. i breathed in loneliness and it swallowed me deeper." Although he wasn't dead, i still grieved him. the love of my life was no longer a part of my life. Gretchen is no stranger to those of us who frequent the bookish blogosphere. She has already established a name for herself through her continuously positive interaction, honest reviews and poetic posts. If for some reason you have yet to make her lovely acquaintance, you should remedy that by visiting her. There is often a certain amount of hesitancy that I encounter reviewing titles by those I have come to know on a somewhat personal level. As you can imagine, being an honest reviewer, it is ca Gretchen is no stranger to those of us who frequent the bookish blogosphere. She has already established a name for herself through her continuously positive interaction, honest reviews and poetic posts. If for some reason you have yet to make her lovely acquaintance, you should remedy that by visiting her. There is often a certain amount of hesitancy that I encounter reviewing titles by those I have come to know on a somewhat personal level. As you can imagine, being an honest reviewer, it is can present possible challenges. However, I entered into love, and you with full anticipation and zero concern. I know her work. It is often the highlight of my day and manages to touch on so much of the unspoken for myself and I believe many others. Still I was not prepared for what was revealed between the pages. love, and you is journey that touches one’s core and dives deep within the heart. It is a glimpse into one woman’s personal life and struggle, but it also mirrors a battle so many of us have fought on our own terms and will come to recognize. With this it delivers a newfound strength and promise. Each verse segues beautifully into the next, forming a raw and powerful message for anyone who has ever loved and been hurt. While filled with one woman’s mourning and loss, there is also something else of true significance and merit occurring. Like a phoenix rising from the ashes, we witness the amazing process of renewal and rebirth. Of forgiveness and self acceptance. love, and you is a self proclamation and realization seen through the eyes of a woman who inspires courage. An undisguised, emotional experience that resonates deep within the heart and stands as a steadfast reminder that pain is not the end. That with suffering comes growth. This is a story of healing and learning to live again. This is life presented in powerful and arresting poetic form. love, and you is for anyone who has ever suffered at the hands of another or even their own heart. Open yourserlf and explore all that love, and you has to offer. This is an impactful and worthy experience for all. You can also find my review here! If you liked poetry books like Milk and Honey and The Princess Saves Herself in This One, THIS BOOK IS FOR YOU. I used to really not enjoy poetry. I thought of it as a piece of work that I had to analyze during English class. I also thought of scenes in movies/shows when a group of people sit in a cafe and a hipster guy stands at a front and proclaims an exaggerated poem while everyone snaps. So needless to say, I used to snicker at the idea of poetry. And I know I’m not alone in feeling this wa If you liked poetry books like Milk and Honey and The Princess Saves Herself in This One, THIS BOOK IS FOR YOU. I used to really not enjoy poetry. I thought of it as a piece of work that I had to analyze during English class. I also thought of scenes in movies/shows when a group of people sit in a cafe and a hipster guy stands at a front and proclaims an exaggerated poem while everyone snaps. So needless to say, I used to snicker at the idea of poetry. And I know I’m not alone in feeling this way. I have changed. I read Amanda Lovelace’s The Princess Saves Herself in This One and fell in love. Just between me and you, I think I enjoyed love, and you just as much. The poems are absolutely stunning. While reading it, I could really tell Gretchen poured her heart out in the book. It’s so honest, personal, emotional, and just raw. Even though I couldn’t relate to all the poems, I certainly connected with them and learned from them. Everyone needs to read this. Whether you were broken in a relationship, you are in an unhealthy relationship, or you don’t want to touch relationships with a ten foot pole. You will not regret reading love, and you. Even if you are not generally a ‘poetry person’, try it out! It doesn’t hurt to try. I used to be in your shoes, and now I love poetry. I don't know how to write about the happy parts because all I knew was the sadness. I have been following Gretchen's blog for a while now and when I found out that she was releasing a poetry collection I had to get a copy, even though poetry isn't a genre I typically read, and I am so glad I got this. Every woman should read this collection of poems. It's about heartbreak an losing yourself in someone and finding your way back to "you". This collection is so real and raw and Gretchen just has a w I don't know how to write about the happy parts because all I knew was the sadness. I have been following Gretchen's blog for a while now and when I found out that she was releasing a poetry collection I had to get a copy, even though poetry isn't a genre I typically read, and I am so glad I got this. Every woman should read this collection of poems. It's about heartbreak an losing yourself in someone and finding your way back to "you". This collection is so real and raw and Gretchen just has a way with words. I can't wait to read what she comes out with next. I am at a loss of words. Its so real and raw. Each word that is written here comes from such a real place that the second I turned to page 5 I started crying and couldn't stop. I couldn't stop crying because Ive been there, Ive felt those things. We may have not be in the same situation but the emotions that were described are exactly the same. I guess I was crying for past Ilse and remembering how I got through it. I believe this book is important for anyone that is going through a hard time, re I am at a loss of words. When I found out that there was a book of poetry out there written by one of our very own fellow bloggers, I just knew I had to get my hands on it! I was not disappointed by it! It was powerful, heartbreaking, uplifting, and thought provoking. For anyone who loves poetry and enjoys reading something written from the heart, this one is for you. For those who do not enjoy poetry or sometimes find poetry hard to understand, you will enjoy these poems because they are easy to read, heartfelt, and to When I found out that there was a book of poetry out there written by one of our very own fellow bloggers, I just knew I had to get my hands on it! I was not disappointed by it! It was powerful, heartbreaking, uplifting, and thought provoking. For anyone who loves poetry and enjoys reading something written from the heart, this one is for you. For those who do not enjoy poetry or sometimes find poetry hard to understand, you will enjoy these poems because they are easy to read, heartfelt, and to the point. those 4 words were repetition to my ears and those 4 words stuck with me the whole time. i might not know this heartbreak but i understand it. there is so many things we should have stopped but did not so we kept welcoming destruction and sorrow in our life. my heart hurt reading gretchen’s words but they were so open and raw. i was falling with each page i turned waiting for her happiness. it was as if i was rushing her but i had to read her journey to learn a great deal. reading her strength throughout brought me much joy and understanding. hands down, one of the best poetry books i have ever read. “i’m not an i don’t know plan. This was an emotional read that reminded me a lot of how I felt the first time I read the princess saves herself in this one. Do you ever read something and feel the words echo through your soul because they could be about you? I won’t say I felt that way about every poem in this collection, because I didn’t, but there were several that squeezed my heart and brought tears to my eyes. I love that it isn’t broken up into sections, but still reads like a journey through differ Full review on my blog. I love that it isn’t broken up into sections, but still reads like a journey through different phases. The earlier poems had my heart breaking, but the ones toward the end patched me up, and might have left me in better shape than before I started the book. By the end of this book, I wanted to hug Gretchen and thank her, and maybe pour both of us a drink. It was painful and beautiful and brutally honest, and I wish younger versions of me had been able to read this book. Maybe I would have felt stronger sooner, learned to love myself a little earlier, and possibly avoided making some mistakes with my heart. It’s not a light and fluffy read, but it ends with some empowering poems about self-love and taking care of yourself, and remembering that love isn’t supposed to hurt. Gretchen does not hold back. Every emotion pours through with clarity and an exceptional rawness through this collection. She is an open book in her poetry; I felt each pang of heartache, each stepping stone of strength, and each and every triumph she expressed as if they were my own. It takes a special kind of writer to translate such intense emotion into clear poetry. Her honesty is humbling and beautiful. I adore this collection, and absolutely cannot wait to read more from Gretchen. "you were meant to be loved by a lover. not a son in search of his mother." YAASSSS. Y'know what I loved most about this? How honest it was. Gretchen Gomez's poetry isn't pretentious, just real. I think I've said before that I'm not usually a fan of poetry centered around one particular heartbreak, but there are exceptions, and this is one of them. I also enjoyed the varying layouts of the pieces - it made the book visually stunning, too. Man, I wish I'd bought a ticket to the Gomez train a long t "you were meant to be loved by a lover. Man, I wish I'd bought a ticket to the Gomez train a long time ago. That sounded vaguely dirty? What I meant was, I'm glad I finally read this and I'm looking forward to Gretchen's next collection WHICH WAS JUST ANNOUNCED HOORAY. This is a very raw and honest poetry collection about loving, hurting, breaking and healing. I am in awe of the strength it speaks and the courage to write and publish something so personal. I also really enjoyed how all the pieces seemed to be part of one giant work and it read like the flow of a journey. I did also found it somewhat repetitive. Sadly enough, the theme of the collection just didn't really resonate with me. I realised recently that poems about heartbreak or healing from unhealthy This is a very raw and honest poetry collection about loving, hurting, breaking and healing. I am in awe of the strength it speaks and the courage to write and publish something so personal. Sadly enough, the theme of the collection just didn't really resonate with me. I realised recently that poems about heartbreak or healing from unhealthy relationships with past lovers is just something far off from my own experiences. This, of course, doesn't make the collection less powerful, but it did make it less meaningful for me personally. I did like the healing, growing, rebirth aspect and the spoken or unspoken message this is possible for all of us and we are all made of magic. and release that breath of stardust. I want to tattoo some of these lines onto my skin. I finished this book today in one sitting and it was such a heartbreaking read. My high school self could have used this book so much. I especially recommend to anyone who has gone through a bad relationship or is currently in one. Very well written, Gretchen! Absolutely lovely. Heartbreaking, hopeful, and potent. The language is simplistic, yet incredibly evocative. Perfect for fans of Milk and Honey and The Princess Saves Herself In This One. Gretchen Gomez is a Puerto Rican poet from The Bronx. When home you will find her watching crime shows, cuddling with her dog, or writing—trying to make sense of things. Gretchen is a full-time lover of words. She is the author of love, and you. She's also working on other collections. tumblr: chicn Gretchen Gomez is a Puerto Rican poet from The Bronx. When home you will find her watching crime shows, cuddling with her dog, or writing—trying to make sense of things. Gretchen is a full-time lover of words. She is the author of love, and you. She's also working on other collections.